It was a promise the Government fully intended to keep and they delivered in milk-loads. 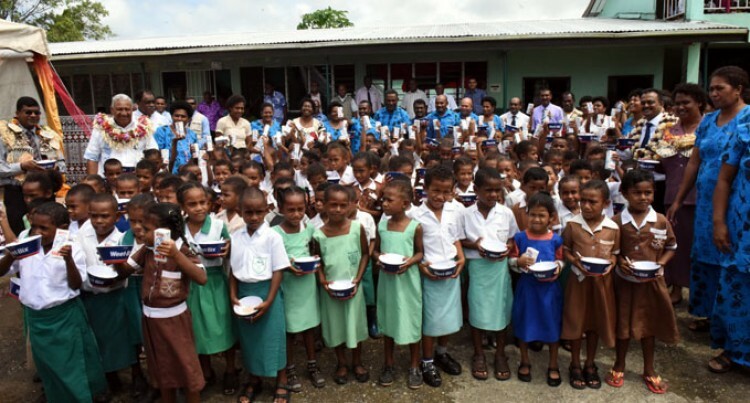 The Voreqe Bainimarama Government’s Free Milk for Schools programme kick-started yesterday as the nationwide rollout began. There are 730 primary schools al together in Fiji. The scheme was launched by the Prime Minister, Voreqe Bainimarama at Nakelo District School. Teachers, students, parents and community members of Nakelo District School, Daku District School, Ratu Veikoso Primary School, Kaba District School, Nuku District School and Visama Sanatan Primary School gathered at the school to show their support. Mereseini Mua, a thankful parent from Nasamila District School in Kiuva, said her meager income from fish sales prevented her from providing a daily supplement of milk for her daughter in Year One. “My daughter is in Year One and I have three elder children in primary school. We live on selling fish and I can’t afford to buy milk for my children every day. “Now with this assistance my daughter can have milk and Weet-Bix, therefore, I’m very thankful to the Prime Minister and the Government,” Mrs Mua said. It was an emotional moment for 72-year-old villager, Eremasi Tikoibaravi, whose grandson attended Nakelo District School. “Of all the schools in Fiji, Government chose this school to launch this initiative. We are very happy. The elders in our villages are happy to have lived to see this day,” Mr Tikoibaravi said. Schoolteacher at Ratu Veikoso Primary School in Buretu, Sailosi Kama, expects school attendance to improve as well. “Now students will have something to look forward to every morning and will develop that eagerness to attend school,” Mr Kama said. He thanked the Government saying it was a great idea. CJ Patel Group and Fiji Dairy Marketing Director, Nathan Hildebrand, said the second shipment from their distributor had also arrived allowing them to deliver all their promised shipments of milk. “The first batch arrived in two shipments with the first arriving two weeks ago with the second arriving just last week so that means the remainder of the first issue will be completed by the end of this week. By the end of the week, all schools in Fiji will have their issue for the first trimester of this year,” Mr Hildebrand said. He said unforeseen problems had caused the earlier delay in distribution. There was also a determination to make sure all schools were included from the start, not just some. He said they were committed to distributing the milk in stages throughout the year to minimise the impact on the schools and maintain enough stocks to last for eight to 10 weeks. “We are distributing milk for over 20,000 students, 1.25 litres of milk a week where each child will be receiving 250 millilitres and a biscuit of Weet-Bix a day,” Mr Hildebrand said. The Ministry of Education’s Director Primary, Kolinio Takali, said they had visited all education districts last month to brief them on the logistical procedures for handling the milk once it arrived in their schools. “In terms of the recording, the documentation and their storage space and who to be in charge of each drop off points. “In some areas where trucks and carriers cannot reach the schools we have drop off points. Schools are grouped in clusters in which one is tasked to transport the milk from the drop off points to each school but many schools are accessible by roads so the supplier will deliver the milk to their doorsteps,” Mr Takali said. He clarified that in terms of distribution, transportation of milk from the warehouse of CJ Patel Group to the drop off points, costs of transportation will be covered by the supplier and from the drop off points to the schools the ministry pays for it. Acting Permanent Secretary for Education, Kelera Taloga said for maritime islands due to transportation issues they were trying to get them their allocation of milk to last 85 days.